As promised on Wednesday I would like to showcase a card made by Jennifer using some of the new products from Imagination Crafts. Sue will be on our screens on Wednesday 11th September 2013 at 5.00 pm on QVC. She has some new techniques to show you using the sparkle medium and there are some new stamps, stencils and new colours to the sparkle medium range. I matted some white then red card onto a black base card, each time leaving a small border showing. Take a piece of white card and using the woodgrain stencil, put it through an embossing machine. Tear around all four edges and then lightly colour with black soot distress ink. Lay the daisy oval stencil over the card and dab some Versamark through it. 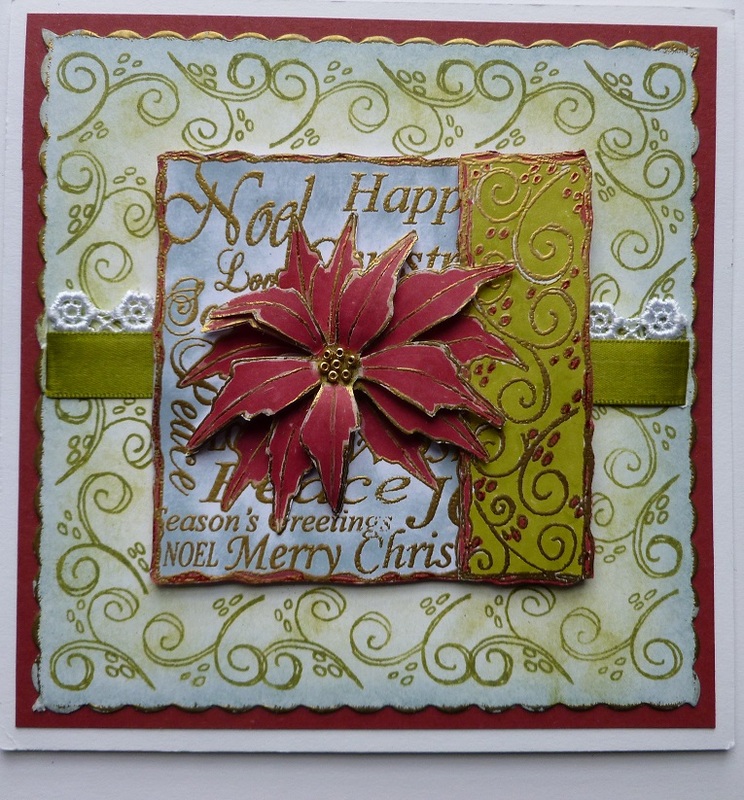 Remove stencil and heat emboss using the Claret and the red metallic embossing powders. Mat this onto the base card. Take another piece of white card and lay the forest deer stencil onto it and spread the black stars sparkle medium over the deer. Remove stencil and leave image to dry. 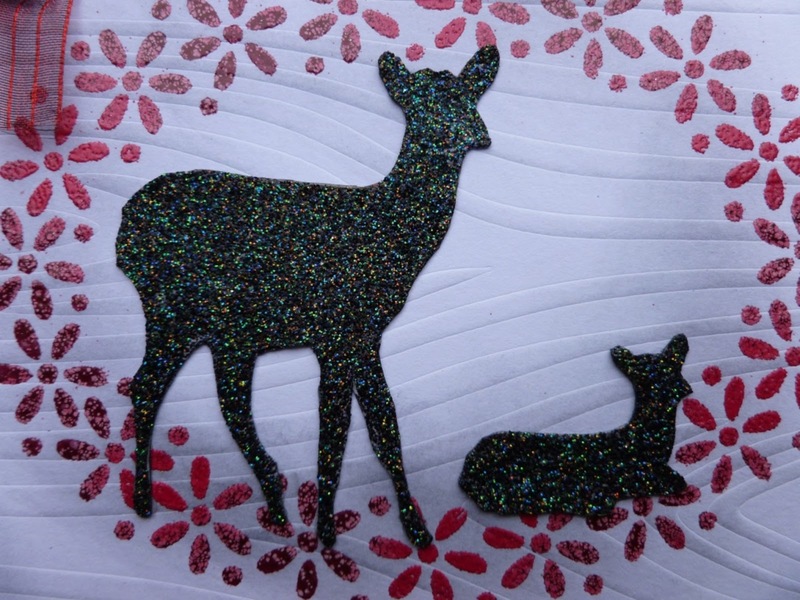 When dry, cut out the deer and glue to the base card as though the deer were sitting amongst the flowers. Add a red ribbon bow to the top left of the card. Well that's it folks, finished, don't forget to tune in on the 11th September lol!! I think it is going to be an exciting show !! 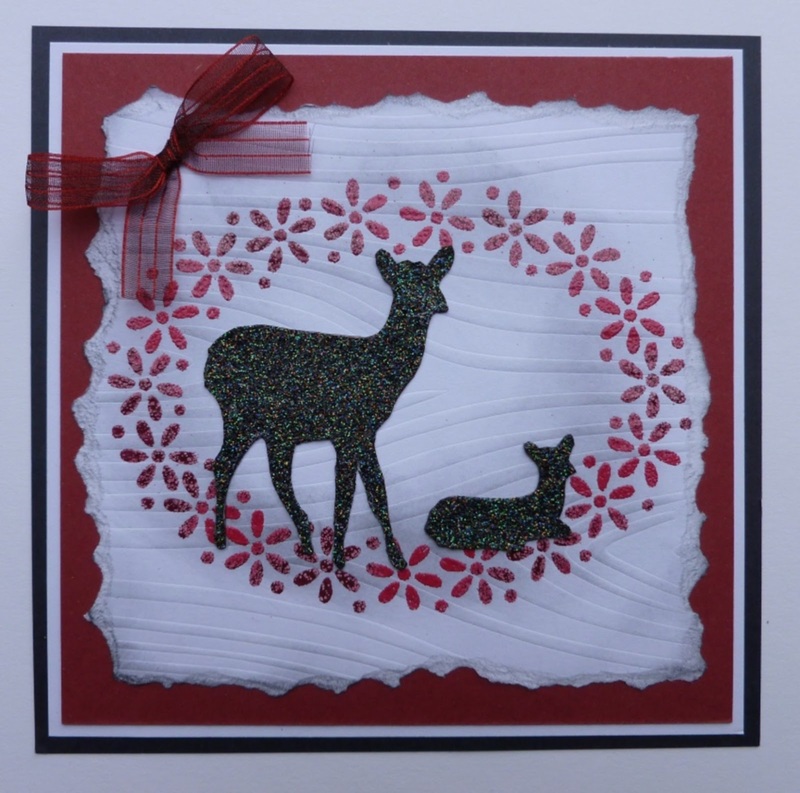 We have two beautiful Christmas cards created by Kim. 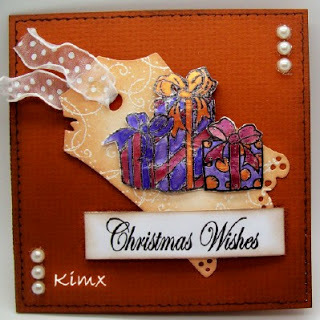 A full detailed description on how Kim made these beautiful cards can be seen on her blog here. Kim has used one of the decoupage Christmas stamp sets from our last show in July on QVC. We will be showcasing some of the design team's samples over the next couple of days. Our next show will be on Wednesday 11th September 2013 at 5.00 pm. Thank you for visiting, don't forget to come back later in the week for some sneaky peeks. Hope you are all managing to fit in some special crafting time. Today's card is a Christmas card, if I dare mention that word lol !!. I promised myself last year that I would get an early start with my Christmas card making, so I'm getting in the mood with this card. 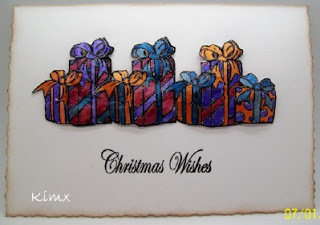 Take some white card and colour using distress inks. Stamp the small flourishes around the edges of the card, and trim with a scalloped blade in you trimmer. Add Versamark to the scalloped edges and heat emboss with gold embossing powder. Colour some white ribbon with a pear green Promarker Pen and put across the centre securing on the back of the card. Add some lace to the top edge of the ribbon. Mat this card onto some red card, leaving a narrow border of the red card showing. Take some white card and stamp the poinsettia stamp four times using a Versamark pad and heat emboss using gold embossing powder. Colour with Promarker Pens, cut out and 3d three of the poinsettias onto the main immage. Glue this to the base card using sticky foam pads. Add tiny gold beads to the flower centre. Well that's it, hope you like it. I'm off to do some crafting now.